Hallo hallo! It's me, Johnathan, back from the far-away land of Offline and fat with turkey and buttered vegetables. As promised, I'm going to rock the twelve days of Christmas with twelve reviews highlighting various modes of holiday celebration in the comical booklets that I so love. And since we're already on Day 3 (French hens!) I'm going to be playing catchup. 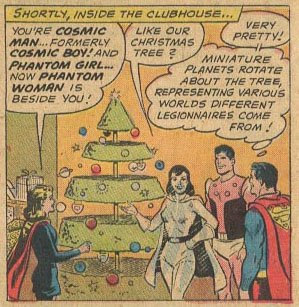 Supergirl has a plot to get a little action for her cousin, so she hauls him into the 30th Century to hang with the adult Legion for Christmas. More on the action-getting plot later - today we're looking at the Legion's decorations. 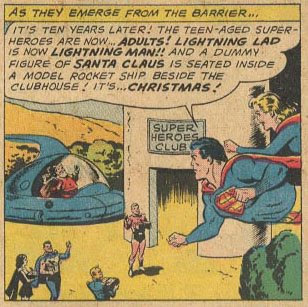 Not too sure why there isn't ever any snow around the Legion Clubhouse, as it's located just outside of either Smallville or Metropolis and I'm pretty sure that at this point those estimable towns are both located in Kansas. Isn't Kansas snowy? Maybe the poles flipped in 2567 or something like that. No matter. I'm sure it's Brainiac 5's doing. I sure do like the Santa dummy in the space ship. Some of my favourite things about the Legion's future are its intersections with our past - rather than playing some crazy game where you simulate nuclear fusion with electronic beans they play holographic Dungeons and Dragons or Spaceopoly (which I hope is all about capturing the Boardwalk Nebula early in the game). Likewise, rather than having a robot out front with a special time portal that loops images of history's greatest Nativity scenes, including the original, they have a crappy Santa dummy that someone thought would look cute in their rocket car. My Dad's neighbours would do that! As for their tree: fantastic! This is the solution for my irrational aversion to even the most convincing fake Christmas tree - make 'em weird abstract treeoid forms. I haven't had a tree in my own place for upwards of ten years but I sure would set up that cone-stack. Especially if I could arrange to have planets revolving around it. Or possibly something else, I don't know. Towns I've lived in? Snack foods I have known and loved (oh, Punkys. I miss ye). The important thing is the revolution.